Many field service businesses are seasonal. For the lawn maintenance, irrigation, landscaping and other outdoor service companies, they can only work when the weather permits them. That can be a scary proposition for businesses that rely on having a recurring income coming from a regular customer base. 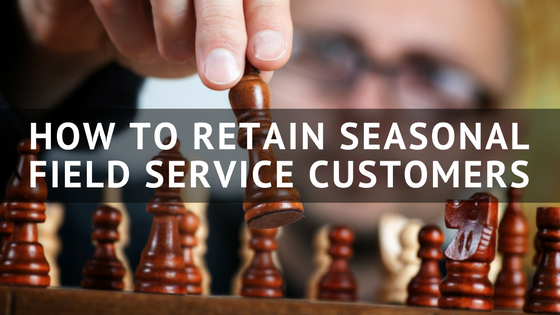 For seasonal businesses, retaining customers can be much harder because of the offseason. You lose contact with customers for a period time and that gives them a chance to shop around, explore other options or drop you altogether. What is a field service business to do? For one thing, the off-season is not a time to sit back on your heels. You need to be active and work to retain customers, year after year. You can’t just put your entire customer base on the backburner for the winter and expect to keep 100% of your customers, it just doesn’t work that way. Customers need to be kept in the loop, they need to be aware of your presence. So here is how you can retain your seasonal field service customers and keep them coming back year after year. One way that you can keep yourself top of mind with your customers throughout the offseason is to build your email list during the months that you’re regularly speaking with them and then utilizing that list later on. Create a schedule for emails that you can send. For instance, create one for right after your season is over as a “Thank you” email, then create one that you can send a month after which might be a general newsletter email with company updates, and so on and so on. One way that you can retain your existing customers is by getting their appointments set early in the off season. Depending on the type of service that you provide, there might be a good reason that you’d want to get people on the books earlier than later. For instance, irrigation businesses have an incredibly busy startup season. They have to start up most of their customer’s systems, so it is easier for them if they have those appointments on the calendar earlier. What it also does is give you a chance to remind customers of an upcoming visit. It is a reason for you to either give a call or send an email, which helps ensure you’re top of mind. Another way that you can retain seasonal customers is by getting their feedback during the offseason. Once a year, you could send out a larger customer satisfaction survey which could cover all aspects of the service you provide. If you use an automated emailing service (HindSite Connect Pro contains this feature), you should be able to create and send a survey very easily. You can create free surveys on sites like Survey Monkey. Once you’ve surveyed your customers, identify your most satisfied customers and ask if they’d be willing to leave reviews for you either on your Google Business listing or sites like Yelp. Many field service companies will give a percentage discount on their services if a customer is willing to go with an early payment. With your existing customers, you should have a good idea of what their costs will be for the year. If you mow someone’s lawn, have a contract for irrigation services or another type of service agreement, you’ll know what you charged for the previous year. Assuming you aren’t raising your prices, offer a discount on their bill if they can pre-pay for part or all of their costs. Want more to keep you busy during the offseason? Why not beef up your online presence with the free eBook, Local SEO for Green Industry Businesses?